The evolution of Moon Dog's first ever "core" beer reaches its third (or is that fourth) and possibly final stage. The beer that started out as a double lager at 7.1 percent ABV and that, in its first iteration, we likened to drinking hop goo, was initially brought down to a more repeatable 5.9 percent ABV when first bottled. From 2015, its draught incarnation has been turning out as an even more sessionable 5 percent ABV, thus appearing as many a crafty pub's happy hour offering. 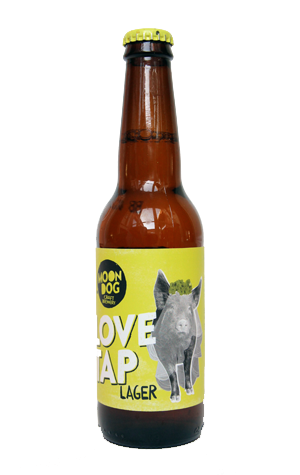 And, finally, Love Tap – now a "fun" lager rather than a double lager is a flat 5 across the board. It's still very much a Moon Dog lager: prominent lime, kiwi fruit and lively citrus hops dominate. There's a touch of light, cracker like malt in there, but only taking time for a brief wave before the hops return, leaving a lingering, resinous bitterness. Smaller than its forefathers, yes, yet still bigger, hoppier and fruitier than your average bear.